Interlocutor: I have scheduled to ask about the origin of the races and also the origin of languages, since many people have asked many questions about it. Ruanel: First and principal, genetically there is a single race that today is the race homo sapiens sapiens. The homo sapiens sapiens is a unique race that has adapted to different weathers and it has also changed of color or skin pigmentation according to these weathers. It has been demonstrated genetically, and I am not the only one who says this only, but rather I am being advised telepathically with entities of Light that there are tribes in different regions of Africa that genetically are a little bit different from an African American. I mean that if they made a DNA test to a man from North America and another to a man from Congo, maybe they find out that they are more similar between them than a man from Congo compared to a man from Namibia, although the last both are of black race. That is to say, the colors of the race don't alter the genetic code at all. On the contrary, There can be more difference between two black men than between a black and a white man. I am always speaking from the genetic point of view. Ruanel: That is to say that what makes the difference between one race and another is the genetic code. We, for example, have a genetic code different from the chimpanzees. Ruanel: No. Johnakan who is always pending, eager to help and not to interfere, the other day brought up the concept that there is a race of terrestrial animals that is totally different among its families. Do you know which one it is? Interlocutor: No, the truth is that I don't have any idea. Ruanel: The canine race. Compare a pekingese and a Great Dane, compares a Dalmatian and a mastiff. Interlocutor: This means that within the canine race there are multiple varieties that are not given in any other species? Ruanel: I explain it better. There are only two races of elephants, the Indian and the African. The African has bigger ears and longer tusks. There are two races of tigers, the bigger is the Bengal tiger. There are four or five different races of lions. Interlocutor: I understand the point. Ruanel: There are several races of wolves, there are hairier wolves, there are wolves of white coat, there are different races of bears, and even the bears are almost as varied as canines. There are the gray bear, the brown bear, the black bear and the white bear. And there are also different types of monkeys. Notice that there are Cai monkeys, Tití monkeys, chimpanzee, and gorilla. Interlocutor: What you say is perfectly clear. Ruanel: Then, as well as animals have different races - that even change in size, because you notice that a Cai monkey can fit on a hand, and a gorilla is bigger than you. In the human species also there are different races. But they only change of pigmentation and in some cases of eyes. But they are similar in size, and the differences are due to the kind of feeding. Interlocutor: Do you mean that Japanese, for instance, are rather of short height due to the consumption of cereals, that is to say rice and others similar? Interlocutor: Because it has changed the feeding? Interlocutor: Let’s see if I understood. All the races here on Earth, in all its varieties are original from here, that is to say of this planet, and they are not extraterrestrials at all? Ruanel: That’s right, the terrestrial race is only one, it varies only in the families. I speak of "families" to use the denomination that terrestrial zoologists use to classify the varieties of animals within a single race. Interlocutor: And all that variety is a creation of the Elohim under the instructions of the Absolute [Eon]. Interlocutor: And how did the languages appear? Ruanel: The question of the languages is an issue of ego, each region developed, according to the idiosyncrasy of the inhabitants, a different way of language. 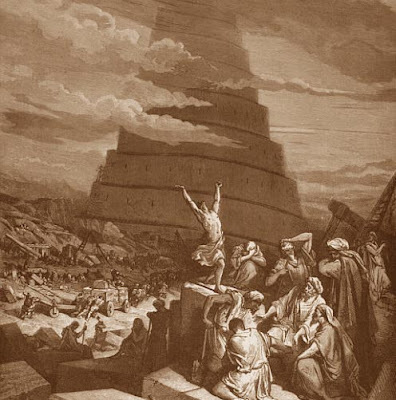 Interlocutor: Needless to say that the famous construction which is called as "The Tower of Babel" in the Bible never existed and the Eloah Jehovah never confused the languages. Ruanel: Of course, that is only a myth, as many. In each region there was a different language spoken period. Nothing to do with religious matters or similar things. Even now it is known that there are languages that have the same source. Notice that Spanish, Latin, Italian, have very similar words. Even some Saxon words have that common source. For example, How do you say “Father” in Latin? Ruanel: How do you say it in Spanish? Interlocutor: I believe that it’s also Padre. Ruanel: Is it similar or not? Interlocutor: Yes, without any doubt. Ruanel: That means that there are clear indications that there was a unique language and later on this original language was distorted in time. Interlocutor: Then there was a unique language at the beginning? Ruanel: Sure, there was an original language in a given moment. First there was a sign language, and as mind was creating, the neo-cortex, the analytic mind, where the abstract thinking resides, it began creating a language, but already vocal. The writing began the drawings in the caverns. Then a language was created which was no longer guttural only, but rather it had different expressions. Interlocutor: It is necessary to recognize that the different languages have arrived to a really astonishing perfection. Ruanel: Yes, but it is also necessary to acknowledge that humanity has been divided in different countries and the intense communication that at some time there was is lost. Interlocutor: Does the same thing happen in the other planets? Ruanel: In the other planets they might have one or two, maybe three languages nothing else. There are very few planets that have as many divisions as Earth, not only in language, but also in religions. In the session Eon 09/MAY/03, Eon spoke about the origin of man and life on the planet. This entry was posted at Monday, July 13, 2009 and is filed under Biblical mysteries . You can follow any responses to this entry through the .